Life has been hectic lately – my Nan died and we traveled to NSW for the funeral and to spend time with our wonderful family and then we had to pack our house up to move the week later and now we are in the midst of unpacking boxes galore but now that the computer is up and running I thought I’d get one post out into the Itchin’ Kitchen. Leaving the house we were in was a bit sad because it had an awesome vegetable patch set up – three massive patches that we filled with fabulous dirt and grew fabulous vegies and fruit. Now all we have to show for it are two pots of herbs, one pot of strawberries and a fridge drawer full of leeks. But there’s hope for this new garden (it can’t really get any worse – very much unloved with its last tenants!!) and we are looking forward to doing something with it. 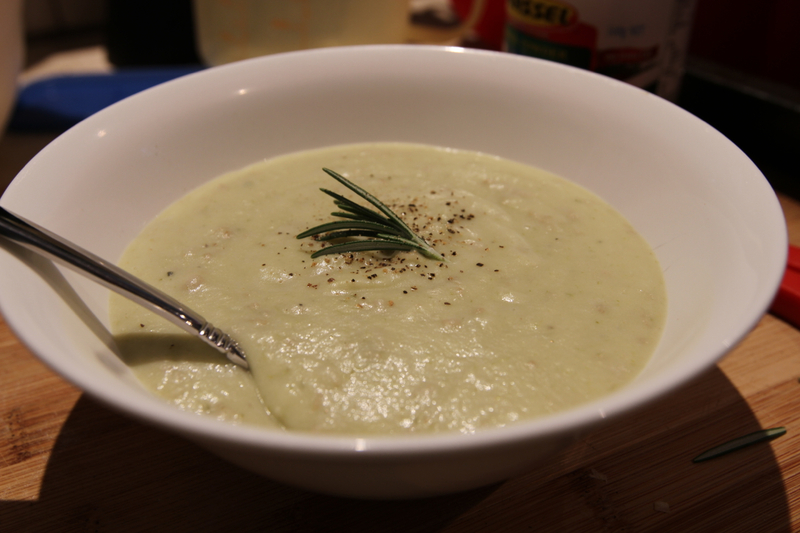 But back on topic – eating up all the vegetables before we left meant finding some recipes and I had all the fresh produce in this potato and leek soup recipe in my garden. I also liked that you left the skin on the potatoes because then I didn’t have to peel! Serves 2 adults, 2 children with enough left over for 2-3 lunch servings. 2 leeks, rinsed and thinly sliced – use quite a lot of the green as well as the white. Heat the oil in a large pot and saute the leeks for a few minutes. Add the potatoes, onion and garlic and keep stirring so they don’t stick. Add the stock, water, salt and herbs. Bring to the boil and then reduce to a simmer and leave for around 20mins or until the potatoes are soft. Add pepper to taste. Blend with your stick blender and then stir in the soy milk (I suppose you could use rice milk but it might not be as creamy, and of course you could add regular cream or milk instead). This recipe was adapted from this blog – she has a few vegan recipes that look yummy and her version of the soup might be even yummier! Next > Bread, glorious bread. oh – if only it was soup weather here! That looks lovely and creamy. Maybe oat milk instead of rice milk would be a creamier option if soy is off limits?